That’s the most honest lead sentence I can conjure, and I don’t believe, even with time to reflect, that I will come up with one much better. I’m currently in quaint, seaside Portland, Maine, and I saw the Sam Roberts Band live at the Port City Music Hall soon after I arrived here. That was four days ago now, and I’m still stunned. Roberts is a fellow out of Montréal (strange, how I have left Canada but perhaps not fully), who does rock with a strong beat and indie undertones. Unlike the beautifully sad, cerebral music for which I often go, Roberts is straightforward, with rifting guitars and pounding drums that pull you right out of your head. His stuff isn’t introverted nor delectably dorky, and perhaps that is what had kept me away since I was introduced to him about a year ago. Tuesday night, however, as I listened to his full set, I was into it. I was dancing, even, which I hardly ever do. It was a treat. Watching someone make music, even rocking stuff, is incredibly intimate. I had forgotten this. How often do you get free reign to simply stare at a man for an hour as his sweaty, gyrating body disappears into a kind of trance? Roberts and his band looked like they went to another world. They were jumping around and pounding their feet into the stage. Roberts would often close his eyes while he tilted his head and poured himself into the mic. Sometimes his voice had so much power behind it that the hipsters around me hollered and raised their hands in reverence. There was nothing theoretical nor witty nor philosophical about what we listeners were feeling. It was just real, and I was ecstatic to have landed there. Being in an audience is a rarity for me, but I know that doesn’t have to be the case. Everywhere, people can’t help but perform. Part of my trip, I’m starting to see, is making the effort to see them. When someone is truly transported on stage, I am as well. Once you get a whiff of that good stuff, you only want more. While I’d love to attribute this realization purely to seeing Mr. Roberts, I know that’s not the case. These feelings really began to crystallize about two weeks ago, in Québec — thanks to another dynamic guy who treated the stage underneath him like he owned the thing. 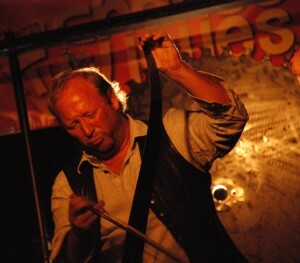 Jean-Marc Massie, beating his saw. The Québecker in question is Jean-Marc Massie, a professional storyteller whose aura of creativity (and pheromones) is so thick that it’s almost surprising you can’t see it. Along with fellow storytellers Simon Gauthier and Marc St. Pierre, he was the opening act at Chants de Vielles, an annual folk festival in the Québec countryside that celebrates all kinds of performers. Before he got on the stage, I was skeptical about how much I would care about what he had to say. The prospect of spending a few hours hearing a story told in a language other than my own sounded exhausting. And it was, but in the best way. As soon as he and his posse strutted onto the stage, it was as though they had grabbed me by the shoulders and shook me. My wandering mind shut up, and my attention was on them completely. Massie was at the front of the stage, the other men at the back. As Massie began to talk and whip his body around, his two companions backed him up with the sounds of a keyboard and musical saws. I had little idea what Massie was saying (something about a person with gold growing out if his head, maybe? ), but it didn’t matter. His body language did. He ran from one end of the platform to the other. He crouched down low and pretended to whisper and then jumped up quickly and began to shout. Behind him, there was a full stock of unconventional iron instruments, and he kept grabbing them throughout the performance. 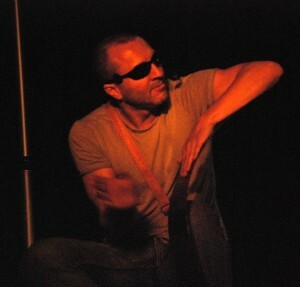 He underscored important moments of his story by hitting the stage with heavy chains. Behind him, there were about a dozen tire irons hanging from the ceiling, which he hit occasionally with another iron. The effect was like listening to the clang of demonic wind chimes. He beat bongo drums as if he was angry with them. By the time he jumped into the audience and played a bugle-like thing in my face, I was amazed. It’s so rare to see that much passion in front of you, and I found myself wanting to bottle it up and save it for later, for use when I need some motivation. I think we spend so much of our day hiding our emotion, keeping an even keel for the sake of momentum. To see someone completely letting himself go was such a release. As I watched him, I realized how desperately I want to be that emotive and unselfconscious. The idea of being able to put yourself out there so fully took the wind out of me. Simon Gauthier, taking a different approach with his saw. After Massie’s performance, we talked a little bit, and I told him how much I appreciated his work. He looked flattered, and I think for a while we did vibe off each other, talking about the few things our shared, limited vocabulary allowed. I wasn’t, however, able to fully convey what had touched me about his show. It made me feel powerless to feel something so strongly and yet not be able to convey it. Perhaps he got my meaning through osmosis. I’d like to believe that. The next day of the festival, we talked again, and he kissed the top of my head as a way of saying goodbye. Is that a Québec thing? I don’t know. My lack of eloquence with Massie is probably partially why I walked up to Roberts after his show. It was a relief to be able to fully explain to someone how much his music and energy had affected me. It felt so good to be woken up, and I had this need to tell him so. Thankfully, he seemed happy to hear it. He was smiling, his eyes still shining from the show’s juice. We talked for a few minutes about his tour and my trip, and he invited me to see his show in New York. He gave me travel advice, and I gave him the address for my blog. I walked away from him and the music hall feeling effervescent and hopeful. On the way back to my trailer, I didn’t even get lost, which for me is like a tiny miracle.